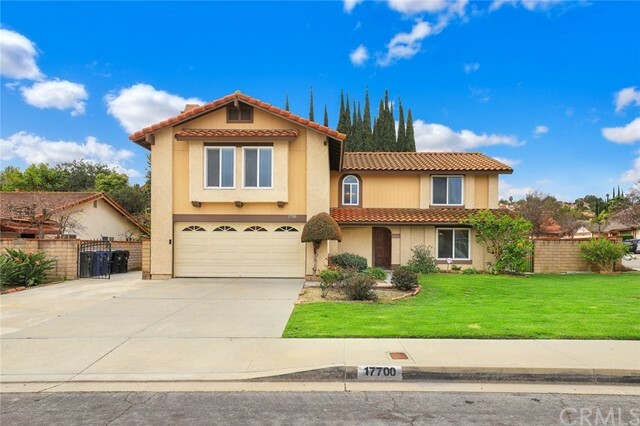 All Rowland Heights homes currently listed for sale in Rowland Heights as of 04/26/2019 are shown below. You can change the search criteria at any time by pressing the 'Change Search' button below. 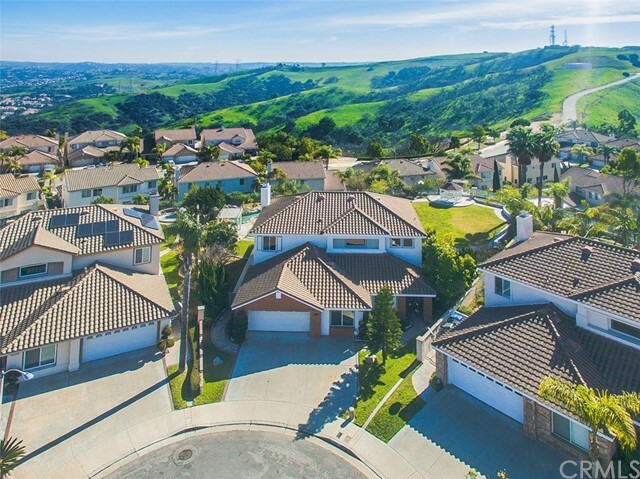 If you have any questions or you would like more information about any Rowland Heights homes for sale or other Rowland Heights real estate, please contact us and one of our knowledgeable Rowland Heights REALTORS® would be pleased to assist you. "Highly desirable area for a large family, employee housing, ora extra large rental property. Per seller, 10 Bedrooms 10 Baths at about 5,999 sq. ft. with permit. Title shows two units with 5,558 SF. Buyer to verify with the city regarding the permits, units, total square footage, # of rooms, # of bathrooms, and the ability to add new suites. High ceiling in the living room. 2 separate kitchens with upgraded cabinets and granite countertops. House with lots of upgrades! Wood floor throughout. Lot size 17,063 sq. ft. Title shows two units." "Great Luxury Home - The Largest Floor plan in Ridgemoor Community with 24 hours security guard. Professional Landscaping with huge flat park-like backyard with Gazebo, and lots of fruit trees. Living Area: 5,370 sq. ft, Lot Size: 16,267 sq.ft. 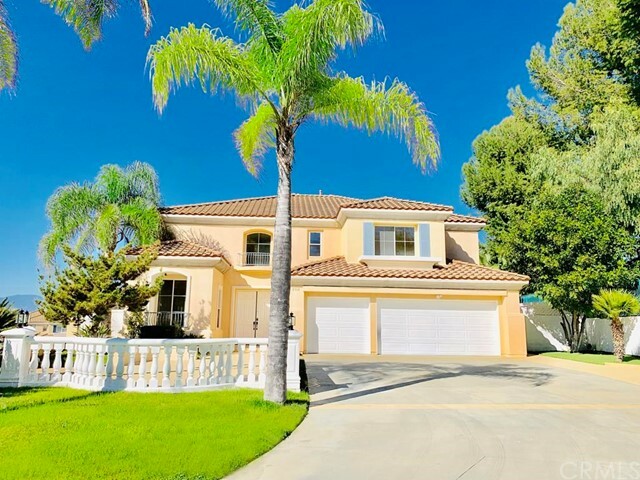 7 Bedrooms & 7 bathrooms (5 suites, 2 EXTRA large suite downstairs), Marble Flooring in entry, Newly Remodeled Home upgraded throughout the house. Engineer wood flooring throughout the house upstairs & downstairs, Living Room, Kitchen & Bathroom all traventine tiles. Double door entry leads to magnificent ceiling in Living Room, formal Dining room with Chandelier. Downstairs has 2 suites (1 of them extra large); both have shower & full bath tub. Very Spacious & Huge family room, Gourmet kitchen with upgraded kitchen cabinet & granite counter tops; large center island, built in appliances, overly spacious breakfast nook area, custom built in Wet bar, and separate China Wok Kitchen. Luxurious Master Suite has a large retreat area and his and hers walk-in closets and private balcony overlooking the backyard. Master Bathroom with Jacuzzi, soaking tub, and separate shower. Dual zoned central air conditioning. Individual laundry room with sink and lots of cabinets. Very convenient location, close to schools, library, parks, and shopping centers. Excellent Blandford Elementary School, and easy access to 60 & 57 FWY. MUST SEE TO APPRECIATE." 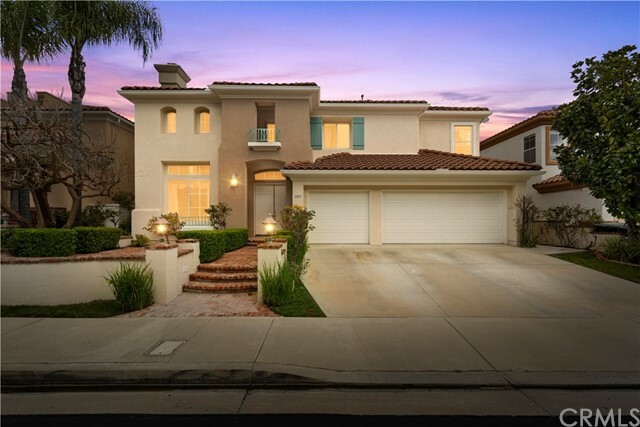 "This spectacular 7 bedroom & 6.5 bathroom contemporary & upgraded residence located in the heart of Rowland Heights 24 hours guard gated community Ridgemoor Estate located at the top of the hill. Double-door entry, High-ceiling and abundant natural light in the formal living room and dining area. New wood shutters in the huge family room. New dish washer and double wall oven in the Gourmet kitchen. Over sized center island with granite counter top, separate Chinese wok kitchen. Wood flooring through out the house. 2 bedroom suites downstairs, Huge master bedroom suite with fantastic city light and mountain view, additional 2 bedroom suites upstairs and 2 bedrooms with Jack & Jill. The professional landscaping bring you all seasons surprise. 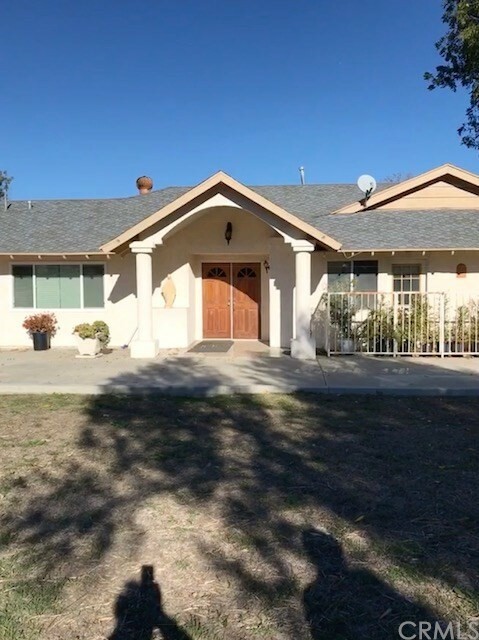 The property located in Rowland Unified school district, which has 7 Gold Ribbon Schools, 4 National Blue Ribbon Schools - 16 California State Distinguished Schools and more state Golden Bell awards than any other school district in the region. One of the safest community in the area, with the convenient location near supermarkets, restaurants, shopping centers, city library, schools and access to Fwy (60 & 57)"
"In Ridgemoor Community with 24 hours security guards, the luxury home has been upgraded as a model home in 1997 with included elegant patio, a jetted soaking spa in the beautiful designed landscaped backyard, and a perfect location. There is a double door entrance with cathedral ceiling and grand crystal chandelier. An excellent open floor plan featuring an elegant living room opening to a formal dining room with chandelier, a large library with luxury built-in book shelves, and downstairs has a stunning full en-suite guest room with sitting area and walk-in closet . Half bath room for guests. A spacious family room with fireplace is adjacent to gourmet kitchen with center island. Breakfast nook with big window that overlook the fully landscaped back yard. Laundry room with cabinets and a washing sink. Upstairs has 4 bedrooms (including master bedroom and one suite room),and 3 bathrooms. Master bedroom with a spacious sitting area, a walk-in closet with organizer and it's own private master bathroom complete with a jetted soaking spa tub and separate glass shower. Two roomy bedrooms share a jack and jill bathroom. Significant improvements about 3 years ago included energy efficient dual-pane windows,wood shutter windows and crown molding throughout, dual zoned AC & epoxy garage flooring. 3 car garage with lots of custom built-in cabinets. Easy access to freeways, conveniently located near the supermarket,park & shopping centers." "Nice and big one story home with 7 bedrooms and 7 bathrooms..Also includes permitted storage units in the back not included in the square footage. Lot size is over 1 acre. Plenty of parking." "Locate in most desired Ridgemoor gated community with 24-hr Guard. Large floor plan with Cathedral ceiling. Double door entry, chandelier in entry way and formal dining room. Large open Kitchen. Island with corona counter top. In addition, add-on sunroom will provide extra rest and activity area. Fantastic 180 degree city lights and mountain view in your back yard and master bedroom. Jr. Suite down stair with full bath. Study room. Large walking closet. Profession landscaping. Close to school, restaurants, shoppings, parks, community center and major FWYs." "Price Reduced! Location, Location! Large NEW remodeled property located in luxury Ridgemoor Gated Community with 24 hours security guard, Cul-De-Sac quiet neighborhood. Property faces SOUTH, the best Feng Sui in the community. One of the best School unified in town and RECEIVES STATE S HIGHEST HONOR AS 2019 CALIFORNIA DISTINGUISHED SCHOOL. It also features a breathtaking, unobstructed, panoramic view of the city lights & mountains. Close to schools, shops, restaurants, markets, golf courses, banks & more. Classic double doors welcome you into this spacious 5 bedrooms, 5 baths beauty! High roof space at receiving room/entrance. NEW kitchen, bathrooms, appliances, glass doors, floors, paint and more upgrades. Large living room and dining area boast beautiful hardwood floors and new crystal LED lightings & mirrors. Other features include a private backyard great for entertaining, central A/C & heating with new NEST thermostat. New granite counter tops & High-End appliances in the kitchen & wine bar. New bathrooms with High-End massage shower panels & bathtub. Front of the property as Manson entrance w/private, long & spacious driveway along w/palm trees. Professional landscaping w/Curb Appeal. Back right side yard w/waterfall swimming pool & Spa, back left side yard w/built in barbecue & Gazebo. Front door & master bedroom w/Double door entry; 3 Master Bedrooms, 1 office and 2 Jack & Jill bedrooms. Main floor 1 master bedroom, other 2 Master bedrooms at 2nd floor. Don't miss!" 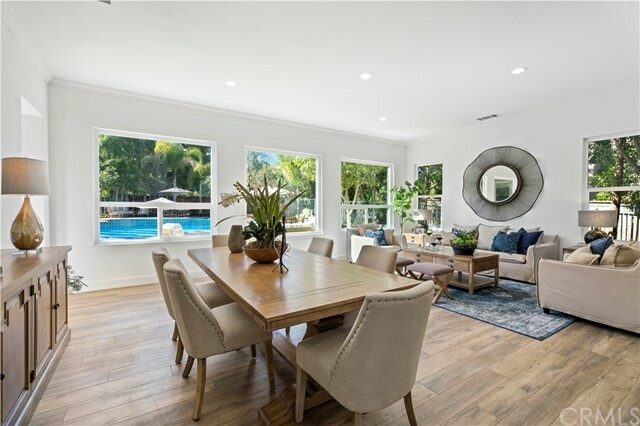 "Located in the exclusive guard gated community of Ridgemoor, 18860 Whitney Place has been completely re-imagined from top to bottom with no detail overlooked. The residence features an open floor plan of over 3,000 square feet, 5 bedrooms (5th bedroom currently being utilized as an office/study), 4.5 baths highlighted by textured tile, crown molding and stone counters. A double door entry welcomes you into the living and dining room filled with natural light from the numerous windows looking out to the perfectly manicured rear yard. The gourmet kitchen opens to a cozy family room warmed by a fireplace and boasts top of the line appliances, tile backsplash and stunning stone counters. Your own personal retreat awaits in the spacious master suite with spa-like master bath complete with soaking tub and designer walk in shower. The resort style rear yard is an entertainer s dream with custom pool and spa, multiple seating areas and lush landscaping. Two more bedrooms and an office/study (5th bedroom) as well as a highly desirable main floor master suite round out this magnificent home. Residents of Ridgemoor enjoy 3 guard-gated entries, horse trails and views of the nearby hills and parks." 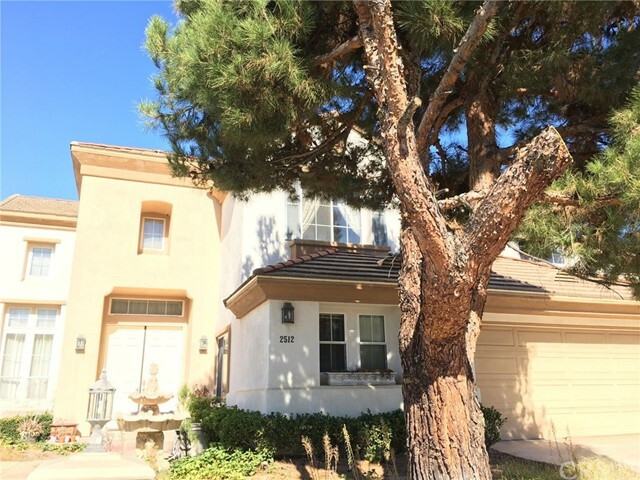 "ITS IMMACULATE MOVE IN CONDITION,SELLERS STARING PRICE FROM $1490.000 AND UP PLEASE SHOW AND TAKE US TO ESCROW Price reduced ! A gorgeous home with normal scenes in a quiet neigberhoodon A hill.A suburban community with local schools,park,restaurants,shopping area,golf course,Financial strucutes, & medical offices,Rowland high school is a public , 4 years high school and international Baccalaureate World school.It was named a Gold Ribbon School in 2017with many academic & sport program to offer .The school is also being reconstuct in to a fituristiccampus. So recreate the big houseto your liking & experirnce our subburban communitylifestyle !other fetures: 3-car garages & Gated frant yard." "Welcome to the prestigious gated community of Ridgemoor with a 24-hour guard. 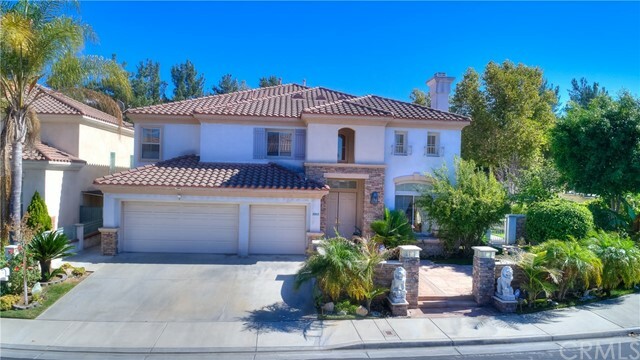 This 7 bedroom 6.5 bath home is located on a quiet cul-de-sac and features a breathtaking, unobstructed, panoramic view of the city lights and mountains. The grand double door entry welcomes you to the living and dining room with a fireplace and high ceilings all illuminated by bright natural light flooding through the oversized windows adorned with custom draperies. The spacious gourmet kitchen features a center island, granite counters and backsplash, 6-burner Viking stove, upgraded cabinets, built-in Sub-Zero refrigerator, separate Chinese wok kitchen, and opens to the family room. The large luxurious master suite is designed with dual sinks, dual walk-in closets, jetted soaking tub, vanity area, and the perfect location to enjoy the panoramic views on the private balcony. Additional features include recessed lighting, new wood flooring, new interior and exterior paint, upgraded carpet, closet organizers, dual pane windows, professional landscaping, built-in backyard BBQ, 2 central AC units, 3-car garage with built-in cabinets, repiping throughout the home done in 2017, and a second master bedroom located on the first floor. Conveniently located near schools, parks, and shopping centers. A must see!" "Great Investment Property!!! Currently being used as a successful Airbandb rental with very high monthly income. Price includes all furniture, fully stocked kitchen and everything in the home. You can easily take over and manage the rental property yourself! 4 bedrooms and 4 bathrooms are newly built in 2016. Each of these 4 rooms are HUGE Master bedrooms with walk-in closet, spacious bathrooms with jacuzzi bathtub, separate shower and dual sinks. Original front of the home has 2 master suites upstairs. Home has a total of 8 bedrooms and 7.5 bathrooms. 2 bedroom suites downstairs. RV Parking and plenty of street parking on this corner lot. Convenient neighborhood that is walking distance to multiple shopping centers, restaurants, park, and bus stop." 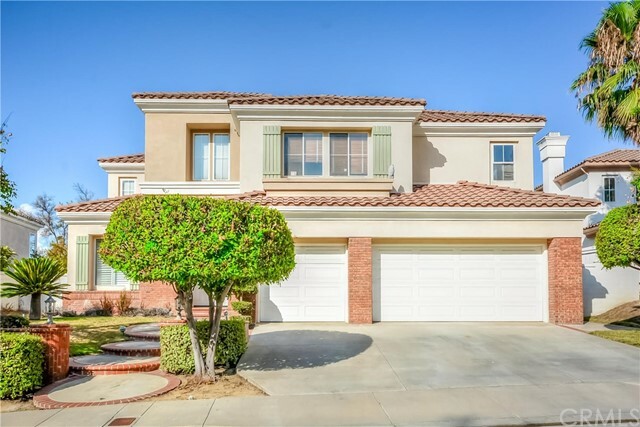 "This popular floor-plan is within the exclusive 24-hour guard-gated community of Ridgemoor in Rowland Heights. Over 3,600 sq ft of living space on a 11,700 lot, the home boasts 5 bedrooms, 5 bathrooms, a separate office, and a 3-car garage. Its coveted location across from a green belt offers serene privacy and stunning views. Walk past a beautifully manicured lawn and step through double entry doors to a grand entrance with dramatic two-story ceilings and large windows that cover the house with lots of natural light. Cozy up next to the fireplace in the family room that opens up to the kitchen and backyard with gazebo, creating the perfect entertainment space! The spacious backyard with lush green grass overlooks the neighborhood with city and mountain views. The gourmet kitchen is fully loaded with a 5-burger gas range, timeless oak cabinets, double wall ovens and a large kitchen island with plenty of cabinet space. The laundry room has overhead cabinet storage and a sink for added convenience. There is a bedroom downstairs with an ensuite bathroom - perfect for in-laws and guests! There are 4 more bedrooms upstairs that open up to a loft with additional built-in storage and a desk. The elegant master suite has two walk-in closets and connects to a luxurious master bathroom with double sinks, built-in vanity table, glass-enclosed shower, and large soaking tub for a relaxing retreat." 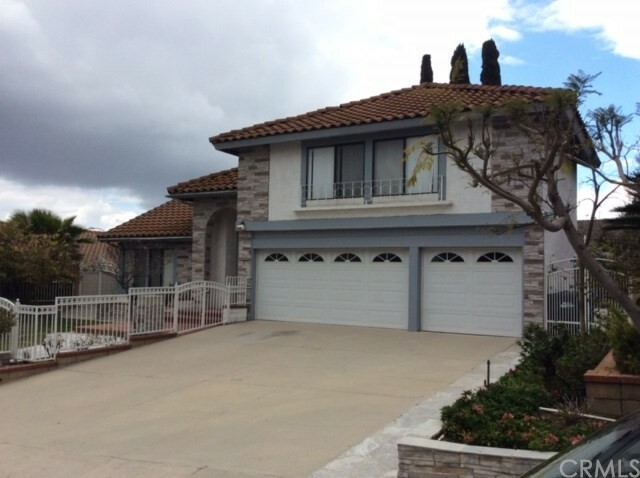 "270 mountain and city lights view on top of Rowland Heights Vantage Pointe Estate! Huge flat lot, extensive back yard with koi pond and gazebo! Formal Living room and Formal Dining room, open kitchen with center island, large family room with fireplace. The house have 6 bedrooms and 5 baths, 2 bedrooms downstairs including a full guest suite, 4 bedrooms upstairs plus library/den/ office. Located at the end of cul-de-sac and quiet neighborhood. Must see!" 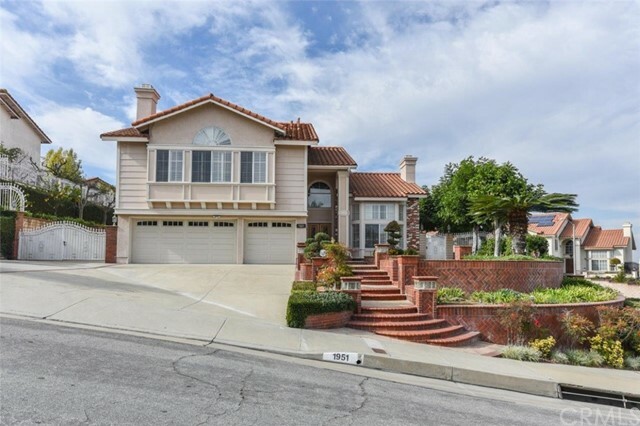 "Prestige grand house in the heart of Rowland Heights hills. Extraordinary view of sparkling city light and snow mountain view. Double story high ceiling in living room. Spiral staircase make this popular floor plan more artistic and popular. 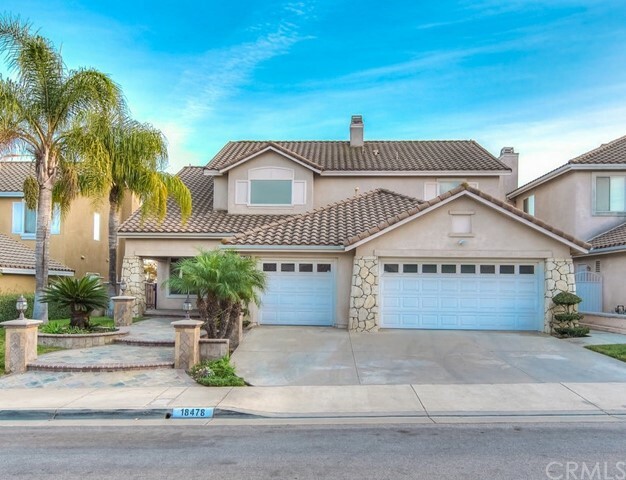 This property is 3,200 square feet featuring 4 bedrooms and 3 bathrooms, including 1 downstairs suites, high ceiling bright and airy master bedroom, plus a large entertaining room, spacious 3 car garages on a large corner lot of 12,783 square feet, with a great entertaining backyard that includes a huge private pool with cozy waterfall! Large kitchen and marble floor, many high quality upgrades. The home was built in 1993. Move in Ready. 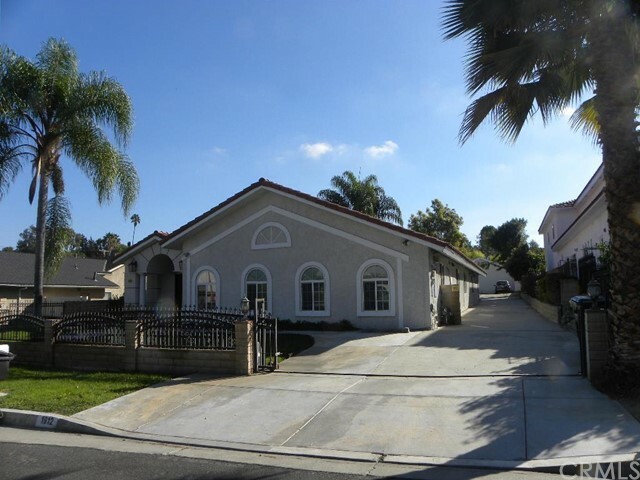 Location is everything; great nearby restaurants, Rowland Unified School District. No HOA! Low property tax! Once a life opportunity for both quality living and great investment." "PRICED TO SELL! LOCATION! LOCATION! LOCATION! This place is not to be missed! Stunning panoramic view of city lights. 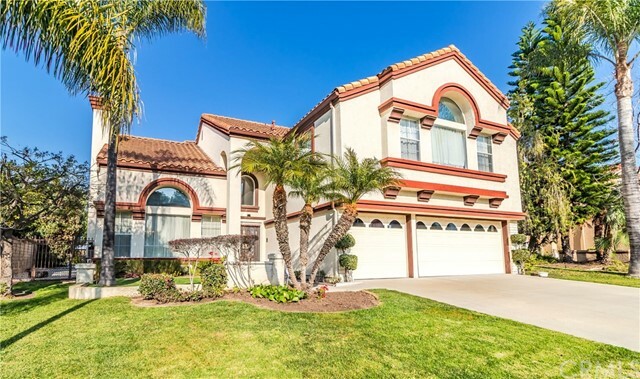 It's in one of the most prestigious community in Rowland Heights Ridgemoor Estates with 24 hour security guarded gate. High ceiling with crown molding. Excellent floor plan. Travertine and wood flooring. Total of 5 bedrooms and 4.5 bathrooms. One bedroom and 1.5 bathrooms downstairs. Four bedrooms and three bathrooms upstairs. Three of the rooms have its own full bathroom. Master bathroom has bath tub and a separate shower with gorgeous view. Walk-in closet. Spacious family room with fireplace. Great kitchen and dining room. Living room with cathedral ceiling. Individual laundry area with cabinets. 3 car garage. Located conveniently near schools, park, library, markets, and restaurants. Close to 60 freeway." "nice view with a lot of tree around. This gorgeous house has located in the beautiful 24 hour guarded gated community-Ridgemore. well lighted by natural lights, excellent property condition, high ceiling, fireplace, and many entertaining features. 6 bed rooms including 4 suites and 5 bath rooms. The additional bedroom in first floor was built by builder as an added option. Downstairs: Living Room, Dining Room, Kitchen, Family Room with Fireplace, two Bedroom with , Entertaining Room, Game Room, Laundry Room, and One Bath Room. Upstairs: Master Suite, 3 Bed Rooms and one full bath room. Two car garage. easy access to 60 freeway, supermarket, school,and bank... Buyer to verify all information." "Great Investment Property!!! Currently being used as a successful Airbandb rental with very high monthly income. Price includes all furniture, fully stocked kitchen and everything in the home. You can easily take over and manage the rental property yourself! 4 bedrooms and 4 bathrooms are newly built in 2016. Each of these 4 rooms are HUGE Master bedrooms with walk-in closet, spacious bathrooms with separate bathtub and dual sinks. Home has a total of 7 bedrooms and 7 bathrooms. 2 bedroom suites downstairs. Plantation wood shutters throughout the home with custom made Oak double door entry. Open floorplan with high ceiling. RV Parking. Huge flat yard with patio and storage shed. Home is located at the end of a cul-de-sac on a very quiet street. Convenient neighborhood that is walking distance to multiple shopping centers, restaurants, park, and bus stop." 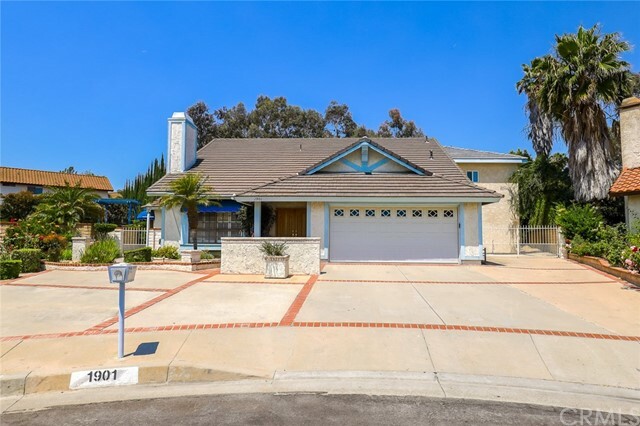 "Sitting on over one full acre of land with scenic views, this unique Rowland Heights home is truly a rare gem. Featuring six large bedrooms, each with a beautiful view of hillsides & mountaintops, three full bathrooms, and over 3,000 square feet of living space, there is enough room to accommodate even the largest family. Located in a private portion of the city, this land has been leveled and is already zoned for agricultural farming and equestrian facilities. This home offers many amazing qualities including gorgeous views, and plenty of interior and exterior space. One of the more unique features of this property is the floor-to-ceiling wood burning stone fireplace which was built by hand by a former homeowner. Another amazing feature is the butler s kitchen located directly next to the main kitchen; this paired with the spacious formal dining room make hosting large gatherings a breeze. But the main showcase for this exceptional home is the courtyard with a built-in pool, large fire pit, and full bar with seating to give your guests a unique outdoor experience. The floor plan has another valuable feature with the possibility to divide the house into two living quarters for multi-generational families. This property offers many potential upgrades such as adding an extension, or restoring the existing barns and equestrian arena. Other features of this one-of-a-kind property include circular driveway, copper plumbing, recent renovations, and panoramic views." 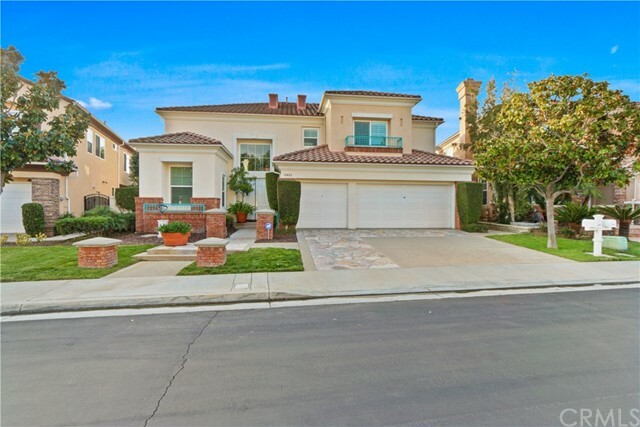 "Luxurious 5 bedroom located in a private cul-de-sec of one of the most prestigious community in Rowland Heights Ridgemoor Estates , a gated community with 24 hours security guards. Entering into the elegant living room with cathedral ceilings opening to formal dining room. Large gourmet kitchen with granite counter tops opening to spacious family room with laminated wood floor, fireplace, and built-in entertainment center. There are two bedrooms on the main level, one of them being a suite. Upstairs large master bedroom and bathroom with access to balcony. Two car attached garage and the 3rd detached garage is being used as a playroom/bonus room. Easy access to freeways, schools, parks, shopping centers, and community center. This is a must see!" "Massive upgrade double glass double door , marble flooring all through out from main door to family room, guest room down stair with hallway bathroom , laundry area with attached 3 car garage , upgrade kitchen cabinet.State of the art stove , recessed lighting in dinning area ,exclusive second kitchen for private cooking, with huge family room with fireplace, Huge master bedroom suite with walk in closet and massive upgrade bathroom , Another huge family room/game room upstair and more. A lot of fruit trees and flowing plants at yard." "This exquisite 3,433 sq. ft. home has 4 bedrooms, 3 baths with a spectacular view of the city lights plus mountain views from the master bedroom. Beautiful ornate iron stair railings, a breathtaking chandelier, living room with fireplace, formal dining area with yet another stunning chandelier. A custom kitchen with upgraded cabinets, Thermador stainless steel stove, double oven, microwave oven and built in refrigerator. The house has granite counter tops, recessed lights and pendant lighting above center island. Kitchen has a breakfast nook and a cozy family room with a dual fireplace. All bedrooms and bonus room have beautiful ceiling fans. Downstairs also has a bedroom, bathroom and laundry area. The master bathroom has a double vanity with granite counter tops, walk-in shower, separate jetted tub and a fabulous walk in closet. Second floor along with the Master there are two bedrooms and a remodeled bathroom. The bonus room has a fireplace, built in cabinets, wet bar and entertainment center which can be transformed into a game room, office or theater room ready to entertain your guests. Great floor plan with lots of light and open space; the home comes with central intercom and vacuum, dual air condition. This backyard is large and perfectly landscaped. Rowland Heights has 7 Gold Ribbon Schools, 4 National Blue Ribbon Schools for your children's best education. Sale of the house is contingent on seller finding a replacement home.Buyer to verify all the information." 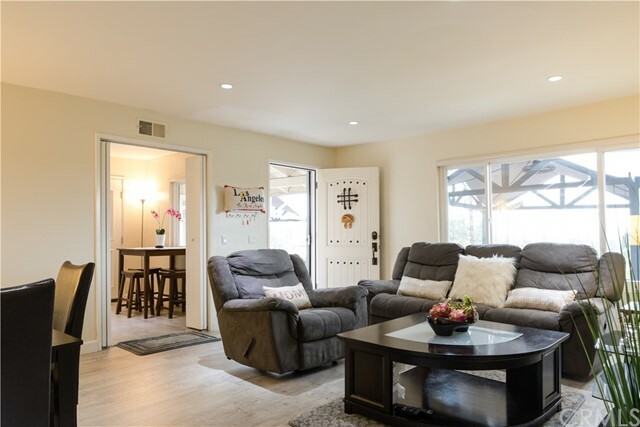 "Highly upgrade home with city lights view and Disney fireworks view nestled amongst Rowland Heights prime residential corridor. 5 bedrooms, 4 bathrooms ,(two suites). One bedroom and one bathroom in main floor. The whole house has been almost completely upgraded. Double door entrance with chandelier leads to Elegant living room. Formal dining room with chandelier. 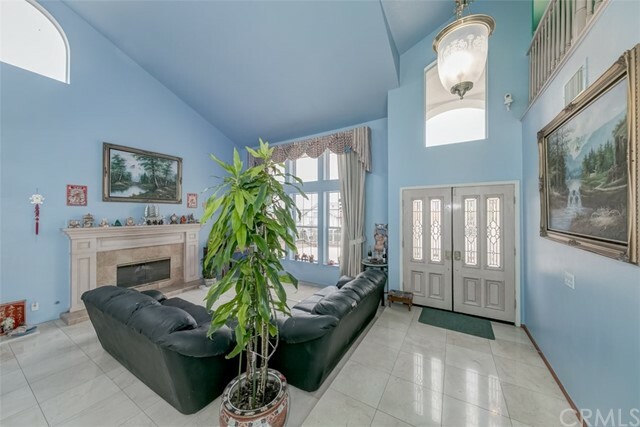 Extra-large family room w/fireplace & nook overlooking the backyard. Newly remodel stunning gourmet kitchen with custom cabinets, granite counter tops, stainless steel appliances, kitchen island and breakfast nook. Spacious and luxurious upstairs master bedroom suite with balcony to enjoy the breathtaking city lights view, large closet with organized and wood wall panels. Master bathroom has newer Jet tub and separate shower. All bathrooms newly remodel. Elegant crown molding and newer recessed lighting fixers throughout. Double pane windows. Rest and relax in an open concept back yard with city-facing views. Large patio perfect for entertaining. 2 zoned central AC/heat. Professionally designed landscaping. Artistically decorated and stunning detail throughout." "Beautiful Property with fantastic city view. Perfect for investors. Currently being used as a successful Airbnb rental with very high monthly income. Monthly rental income around $10,000, annual income is around $120,000. The high end furniture will also be included in the sale. This home features fully remodeled 4 beds and 4 bathrooms home. Open floor plan with recess lighting. Huge flat & beautiful yard will make you feel like you are staying at a resort. Close proximity to shopping centers, restaurants, supermarkets, park, and bus stop. You can easily take over and manage the rental property yourself. Come see this gem before it's SOLD."